David A. asks: What exactly are smelling salts? Do they really work to wake up unconscious people? Smelling salts have been used for everything, from reviving those who have fainted to athletes needing a chemically-induced “wake up.” But what are smelling salts? Are they actually an effective medical treatment? How do they work? Are they toxic and dangerous? Smelling salts aren’t what most people think of as “salt”; there isn’t sodium in smelling salts. The main and most active ingredient is ammonium carbonate ((NH4)2CO3H2O), a solid chemical compound that, when mixed with water (H2O), releases ammonia gas. 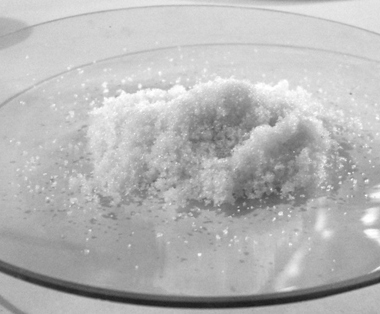 Ammonium carbonate also goes by “baker’s ammonia,” due to the fact that it was used as a leavening agent prior to the popularity of baking soda or powder in the early to mid-19th century. In fact, baker’s ammonia is still used in a few traditional Scandinavian Christmas time recipes like Speculoos (spiced shortbread biscuit) and Lebkuchen (similar to a gingerbread cookie). Often, another main ingredient in smelling salts is some component that masks the terrible smell of ammonia gas, usually perfume or, even, flowers. Smelling salts work because the human body aggressively reacts to the ammonia gas in several ways. When sniffed, the gas irritates the nostril membranes and lungs, so much so that it triggers a sharp inhalation reflex, bringing in more air and thus more oxygen. This can result in improved alertness. When a person passes out, they sometimes lose consciousness due to decreased blood flow to the brain. Sniffing smelling salts can raise a person’s blood pressure, heart rate, and oxygen levels, helping brain activity and reactivating the sympathetic nervous system. While medical research does confirm that sniffing smelling salts by someone who has had a fainting spell can in some cases be beneficial, the question of the toxicity of ammonia gas remains. Exposure to large amounts of ammonia gas can cause lung damage, blindness, and even death. It is also highly explosive and corrosive. The Occupational Safety and Health Administration (OSHA) even set a 15 minute safe exposure level for highly concentrated ammonia gas. That being said, the amount of ammonia gas that is being breathed in with a snort of smelling salts is minimal and only causes its intended effect – irritation of the nose and lungs. There has never been a known case of someone dying of ammonia gas poisoning due to using smelling salts. More practically, sal ammoniac was used in the Middle Ages to change the color of vegetable dyes. In the 17th century, it was discovered that a liquid solution of ammonia could be distilled from the shavings of deer hooves and antlers. When crystallized, it was seen to also have carbon, making ammonia carbonate – then called “salt of hartshorn” when made in this way. Beginning in the early 20th century, boxers began using smelling salts during boxing matches to keep themselves alert after a particular hard blow to the head. In theory, it “revived” the fighter enough that he would stay conscious long enough to finish the match. More recently, smelling salts have been banned in competitive boxing, first in Britain (in the late 1950s) and then in America (in the 1960s). This isn’t due to the inherent dangers of ammonia gas, but rather that it potentially hides a more serious injury. The reasonable assumption goes that if someone needs to be revived by the use of smelling salts, then there is a much larger medical issue (head trauma, concussions, neck issues) at stake and they should not be going back into the ring. While smelling salts have been banned in boxing for years, they are still legal in other sports. In fact, there has been in a rise in use of them, especially in football and hockey, where jarring hits can make one woozy. Peyton Manning, Michael Strahan, Landon Donovan, Alexander Ovechkin, Samuel Eto’o, Brett Favre, and Tom Brady are just a few of the more prominent players who have either admitted to or have been photographed sniffing smelling salts on the sidelines. In 2005, the Florida Times-Union (out of Jacksonville, Florida) published a story about the rise of smelling salts usage, with many players admitting that they use them before every game, even multiple times throughout the game, because “Players speculated that (smelling salts) raised their adrenaline levels by a factor of 10.” Of course, there is debate on whether or not this is really just all in their heads. Outside of the placebo effect, they could, very likely, get the same physiological results from simply taking several deep breaths, and without needing to regularly inhale a highly toxic gas. It should be noted that smelling salts can cause asthma attacks, and should not be used on an unconscious person unless the user is certain that said person does not have asthma or other breathing disorders.